I really like Next Issue, the app that I’d describe as the Netflix for Magazines (pay $9.99-14.99 a month for unlimited access to its library of magazines), however it’s available on iOS but not Mac. 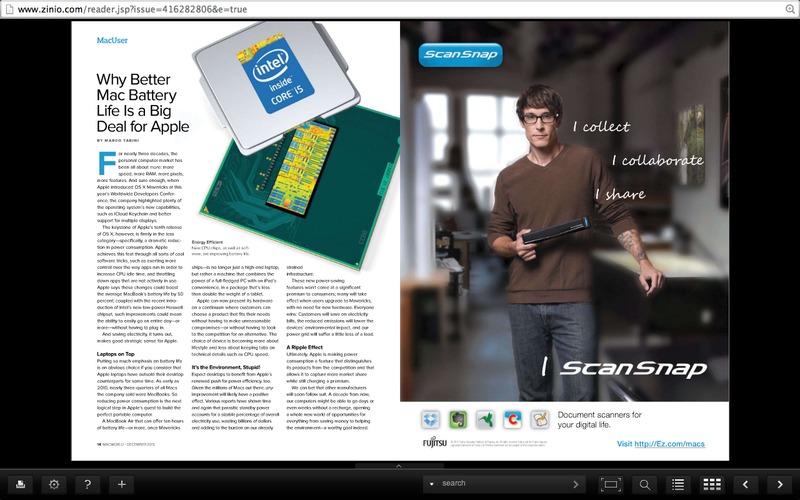 Also the Windows 8 app doesn’t allow you to zoom very far which makes some of the magazines difficult to read. 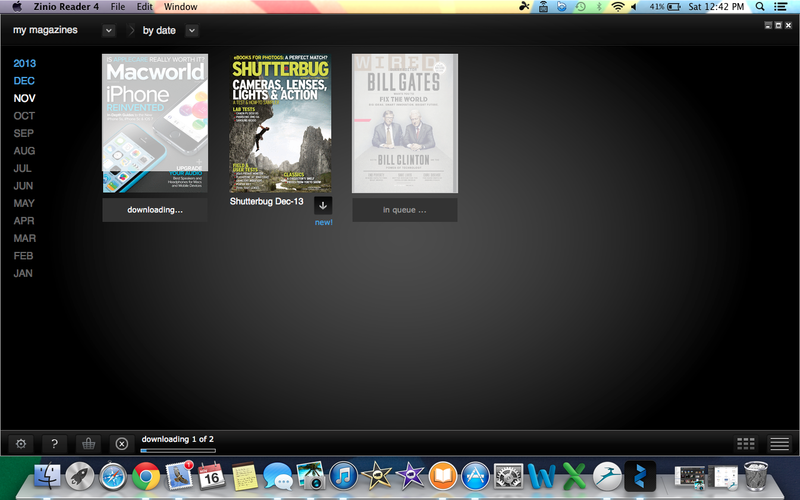 Today I started using Zinio which is available for Mac (as well as iOS, PC and other platforms). 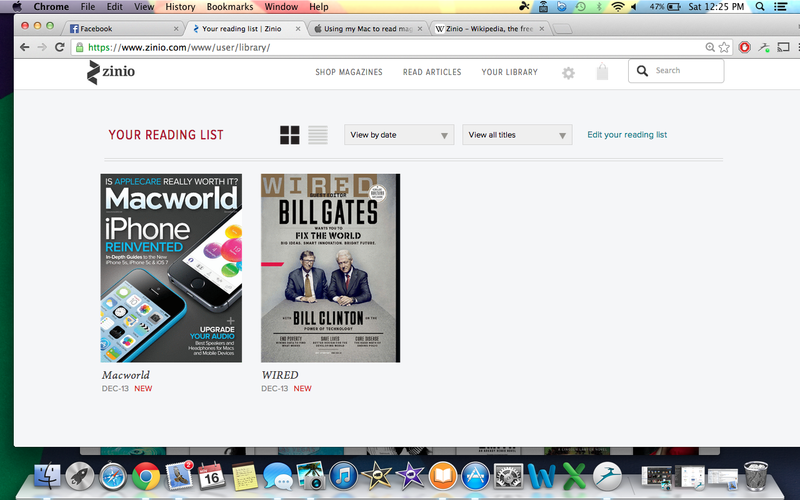 You can also access your magazines through a web browser if you’re away from your Mac and can’t download the software. You can subscribe to 3 magazines for $5 a month via the Z-Pass service (you get a free 30 day trial as well) and you can subscribe to additional magazines if you wish at mostly affordable rates. Both the web reader and Mac app offer a great reading experience on the Mac and I look forward to checking out some more magazines with it. The Z-pass selection seems adequate and includes a great many popular magazines. 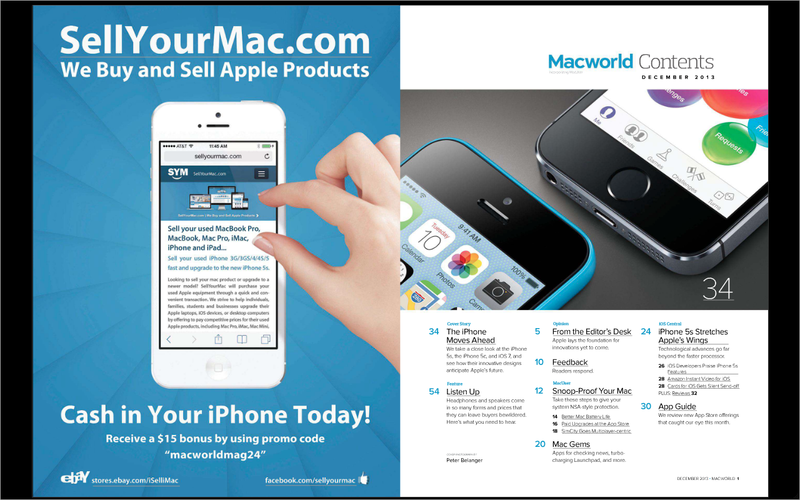 Right now I’m using 2 out of my 3 magazines for Macworld and Wired. Other notable publications include Newsweek, Cosmopolitan, Maxim, PC World, Road & Track and many more. You get more bang for your buck with Next Issue, but Zinio definitely offers the better desktop reading experience and of course being available on Macs is a plus. So far I can recommend the service, it’s affordable and convenient. Until Newstand comes to Mac it’ll have to do. This entry was posted in Technology and tagged magazines, magazines for mac, OS X magazines, read magazines on mac, Zinio. Bookmark the permalink. Zinio is also working with public libraries so you can get some FREE magazines too. My library system has a very nice digital collection you can access with your library membership. Awesome, I’ll have to check it out, but I doubt the library on base would have that unfortunately.